Ultherapy® is the only FDA-cleared procedure to non-invasively lift skin on the neck, chin and brow. Responsiveness varies from patient to patient, and, occasionally, the results are “sub clinical;” that is, the collagen rebuilding on the inside that helps counter the effects of gravity does not have a visible effect on the outside. Some patients may benefit from more than one treatment. In the early days following face and neck treatment, patients commonly report some lifting, toning and plumping of fine lines. While this immediate “plumping effect” can be temporary, it signals that the beneficial process of new collagen generation has begun. 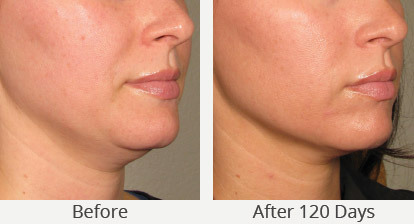 Skin lifting on the brow, neck and under the chin is reported to continue to build over the next 2-3 months. Further improvements can even appear up to 6 months following a procedure. After a single décolletage treatment, the collagen building process is initiated and a smoothing of fine lines and wrinkles of the chest may be noticeable within 90 days. Improvement can also be seen at 180 days post-treatment.